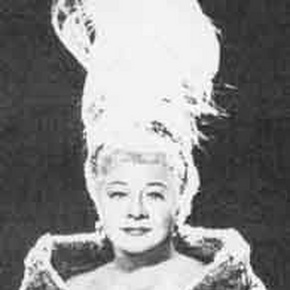 MP3 of the Day: Sophie Tucker, "Some Of These Days"
It's Preservation Week and the next best thing to a cryogenic thaw is to download a digitized cylinder recording of "Some of These Days" by the inimitable Sophie Tucker. Known as "The Last of the Red Hot Mamas," Sophie Tucker was more than just another early 20th century entertainer in Vaudeville, Broadway, and film. An anachronistically progressive character, she touted the merits of being a powerful, glamorous, full-figured, older woman who was vocal about her sexual appetites. Tucker was able to captivate audiences with raunchy humor, a texturally raspy voice, and haunting nostalgic interludes. A Russian/Ukrainian immigrant who attempted to transcend the racial segregation that drenched the music and entertainment industry, Tucker was also a union organizer. For those of you who think old music is boring and there's nothing in it for you, check out "Some of These Days." Tucker's voice has a quality similar to Molly Siegel of Ponytail, that hints at boundless range. The longing and desire of this song could sit comfortably inside of a Larkin Grimm album. Tucker's weary and essentially modern crisis of loneliness are profound enough to reach us way up here in the 21st century. In 2009 Archeophone Records released an anthology of Ms. Tucker's earliest recordings, entitled Sophie Tucker: Origins of the Red Hot Mama, 1910-1922. Music critic, Jody Rosen, called her "a proto-feminist and taboo-shattering sensualist, and... a herald of pop musical modernity." (accessed April 23, 2012, New York Times) Imagine what Tucker could have done with a loop pedal. Download/listen to more cylindrical showstoppers here on the Cylinder Preservation and Digitization Project (CPDP)'s FMA curator page or check out the full searchable/browsable collection on the CPDP website. The CPDP digitizes cylinder recordings (the earliest commercially produced recordings) in an effort to preserve and make them accessible to a wider audience and is a project of the Department of Special Collections at the Donald C. Davidson Library at UC Santa Barbara. You can even adopt a poor orphan cylinder (Puh-leaze suh, can I have some more digitizing?) or friend the CPDP on Facebook. To learn more about Sophie Tucker, look to the sources consulted for this blog post: Wikipedia, Jewish Women's Archive, and Jody Rosen's review of Archeophone's 2009 Tucker anthology in the New York Times. Also, keep your eyes peeled for this feature-length documentary about Tucker, currently in the works.